The Accessibility Professionals Team has helped many people and organizations transform their homes, workplaces and public facilities making them easier to use. Accessibility is about helping people of all abilities to enjoy safety, comfort and independence in their everyday living. Accessibility Professionals Inc. specializes in providing industry leading products for making bathrooms and kitchens accessible and easier to use for people with physical disabilities as well as individuals of all abilities. Our goal is to assist people to arrange their bathrooms and kitchens to best meet their needs and to maximize their independence. In addition to our online resources, our knowledgeable staff is available to assist homeowners, architects, designers, contractors, caregivers and anyone else who has an interest in accessibility solutions for bathrooms and kitchens. Many of us have been caregivers for elderly or disabled family members. The ranks of both seniors and family caregivers are swelling. 1 of 4 households in the U.S. and Canada care for a senior loved one. An aging loved one will often resist change, but don't delay too long. Many people wait until after there has been an accident to make changes. Some 50% of senior hospital admissions are due to injuries from falls, 20% of these lead to deaths. 50% of these falls occur in the senior's own home, with the bathroom being the most hazardous room in the house. I'm Paul Holt, founder of Accessibility Professionals. I've also been a family caregiver to loved ones who experienced declining mobility, health and independence issues. As a family caregiver I wanted most of all to help my loved ones to maintain their dignity, independence and quality of life as they age. One of the major challenges we have aging in place is that our own homes are often not designed to deal with our changing needs. As we get older climbing stairs and opening doors becomes more difficult, bathrooms and bathtubs aren't as easy to use, and we require 4 times more light as a senior citizens. The good news is that it is there are simple things we can do to make our homes more elder friendly, for example increasing lighting, removing tripping hazards and changing door handles are easy and low cost. Adding grab bars or a bathtub chair makes the bathroom easier to use, or in some cases a barrier free shower may best meet your needs. On a personal level I want to share my father's story. 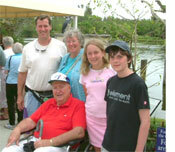 My father, Bob, was my inspiration for founding Accessibility Professionals. My father's health began to seriously decline a number of years ago. Dad and Mom clearly wanted to stay in the home where they had lived for over 30 years. Some of the initial things we did to help Dad age in place, were to make some basic home modifications. We changed the front walk so he could get into the house. We added stair lifts so he could get up and down the stairs, we added a bath chair, hand held showerhead, grab bars and toilet rails. Dad also utilized mobility devices, such as a walker and a transfer chair. These changes helped for a couple years, but as Dad's health declined he started falling. As Dad required more help the load on my mother, a senior herself, became a concern for the family. In Canada, we are fortunate to have universal health assistance and we called the local agency and arranged to have an Occupational Therapist assess the situation at my parent's home. Some of the recommendations were as easy as to encourage Dad to use his walker more often. We also arranged to have a nurse come in on a regular basis. Throughout the whole process of Dad's health decline I take comfort in the fact that as a family we were able to help him to age with dignity at home. As we age there really is a continuum of care. You need to reach out for advice and to investigate the resources available. There are quite a few, but you need to do some research. In all of this don't forget the caregiver. Care giving is often a thankless job and many caregivers suffer from depression. Caregiver relief or respite has to be built into any care plan for an aging senior. Accessibility Professionals Inc. has completed and continues to do extensive research and networking in the home healthcare services community. Our network includes seniors, caregivers, nurses, occupational therapists, physical therapists, doctors, architects, homebuilders and renovators, building supply companies, home healthcare professionals, medical equipment companies and retirement and long-term care residences. Our experience in these areas provides a more complete view of the issues of aging in place. At Accessibility Professionals we also carry the National Home Builder's Association designation as a Certified Aging in Place Specialist. I encourage you to explore the wealth of information provided on our websites and use it to live more safely, comfortably and independently. Please don't hesitate to call us for assistance.